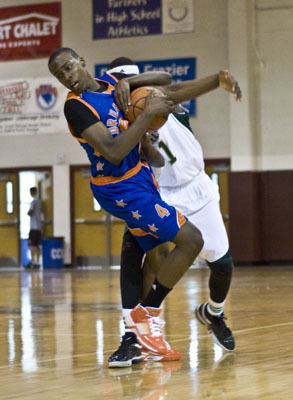 JERRY HENKEL/LAS VEGAS REVIEW-JOURNAL Shabazz Muhammad plays in the Adidas Super 64 AAU tournament at Cimarron Memorial High School in Las Vegas, Wednesday, July 22, 2009. It was 9:09 a.m. Wednesday when Shabazz Muhammad threw down his first dunk. About five minutes later, he dunked again. The rattling rim was an alarm clock for those in the gym still rubbing the sleep from their eyes. Basketball might not be meant for the morning, but Muhammad is used to early starts. “When I was 2, my dad had me dribbling a ball in the garage. I remember it now,” he said. How does a kid grow to be ranked the nation’s No. 1 player in his high school class? He picks up the game early and stays late, as Muhammad did on the opening day of the adidas Super 64 tournament. He rolled out of bed and scored 29 points as his Dream Vision (San Diego) team lost to the Atlanta Celtics 74-68 at Cimarron-Memorial High School. He returned in the evening and scored 15 in a 67-56 victory over KC Pump N Run. Muhammad, 15, will be a sophomore at Bishop Gorman in the fall, and he’s on the rise as Las Vegas’ next prodigy. Hoop Scoop ranks him first in the class of 2012, and similar rankings by other recruiting services are expected to follow. College coaches are getting to know him well. North Carolina’s Roy Williams, Kansas’ Bill Self, UCLA’s Ben Howland, Texas’ Rick Barnes and Oklahoma’s Jeff Capel watched his morning performance. Muhammad’s dad, Ron Holmes, has a popular cell phone number, and UNLV’s Lon Kruger is among the callers. “It’s just so early in the process. He still has at least two years until he has to make a decision,” Holmes said. Holmes is not new to this. His daughter, Asia Muhammad, is an 18-year-old pro tennis player. Holmes was a basketball star at Southern California, leaving in 1985 as the Trojans’ seventh all-time leading scorer. Shabazz Muhammad, a 6-foot-4-inch shooting guard, has a wise teacher in Holmes, who said, “I just make sure he stays grounded and focuses on basketball and academics. I talk to him about being humble and working hard,” and the message is clearly getting through. “I remember when I was younger, I wasn’t as good. I just kept my head up and kept playing hard and got to this point,” Muhammad said. “I really wasn’t that dedicated to play the game, and now I love playing. I’m hungry to play the game. Muhammad, a left-hander, scored most of his points Wednesday on dunks, layups and mid-range jumpers. In the second game, he was outplayed by teammates Winston Shepard and Nigel Williams-Goss, both of whom will be Findlay Prep newcomers. Muhammad will play for the Prospects, his other summer team, next week in Phoenix. He’ll have a target on his back this summer and in the future, but he doesn’t seem to be dealing with too much too soon. Muhammad can sharpen his ball-handling and long-range shooting, as could any kid his age. He has overcome what his dad calls “a little tic problem,” a small form of Tourette’s Syndrome he has dealt with since childhood. “If you know about it, you will be able to tell by watching him,” Holmes said. The only sport Muhammad plays is basketball. He likes football but decided to concentrate on what he does best. His daily routine includes running, shooting and lifting weights. “My dad goes out and works with me almost every day. Intense workouts,” he said. “We get up a lot of shots, probably around 300 a day.